Have heartburn? Juice this for a quick, easy remedy. If you think I'm crazy for suggesting lemon juice for heartburn or acid reflux, you're not alone. When I had first heard of this I also thought it sounded crazy. But when you look to science, you'll see it makes perfect sense. If you’ve ever felt a burning sensation in your chest or throat, trouble swallowing, nausea after eating or an undignified urge to burp, or even pain when lying down or bending, you probably already know you’re one of the millions of people who suffer from heartburn. Also known as acid reflux or, if sufferers experience symptoms more than twice a week, as gastroesophageal reflux disease (GERD), it can have a detrimental effect on your health, and happiness. So what helps cause heartburn? Most heartburn sufferers will experience symptoms after a large, overly rich meal. Food that is highly acidic or irritates the stomach, such spicy and high-fat foods are cause of heartburn, as well as chocolate, tomatoes and tomato products, alcohol, caffeine and fizzy drinks, according to Livestrong.com. Nutritionist Kelly Snyder also ranks constipation or poor elimination, and excess belly fat as contributing factors. When talking about acidic foods, citrus fruit such as lemons is sometimes mentioned as trigger for heartburn. So why do we suggest juicing lemons as a solution for heartburn? This comes down to a common misconception about lemons. The fact that lemons are acidic (pH is below 7), is incontrovertible. However, inside the body, things change. 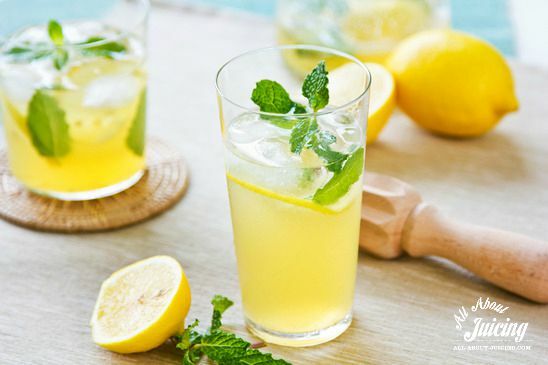 When lemon juice has been fully metabolized and its minerals are dissociated in the bloodstream, it has an alkalizing effect and therefore raises the pH of body tissue (pH above 7 is alkaline). Dr. Mee Lain Ling, a registered doctor of traditional Chinese medicine, urges us to note the difference. Although they taste sour, lemons are thus alkaline forming – which means they actually help neutralize acidity in your stomach. So if you suffer from heartburn, juice lemons as part of your regular juicing routine – I love adding fresh lemon juice to my green juices, or squeezing it into a carrot and apple juice for some extra zing. And if you need an instant heartburn fix, try squeezing a dash of lemon into a glass of water and seeing if it improves your symptoms. Dr. Ling also suggests using lemon juice to see how acidic your body currently is. If you drink lemon juice in hot or warm water and it tastes very sour, your body is very acidic. If it tastes like lemonade to you (without the sugar) your body is in a healthier, more alkaline state! Depending on your ratio of lemon juice to water, your body’s level of acidity and how often you take lemon water, eventually your lemon-water shouldn’t taste sour at all! Do try this at home and let me know how sour/acidic you are feeling or if life just keeps giving you lemonade. Apart from helping you with acidity, lemons have been used for centuries to treat various sicknesses, for stain removal, and even to clean the house. They help keep your skin clear and radiant, assist in weight loss and even repel mosquitos. Lemons reduce blood pressure, detoxify the blood and organs, and reduce mucus build up in the body. They’ve even been used in Chinese medicine to help reduce abnormal fluid discharge (sweating, incontinence, bed wetting). If that’s not enough, lemons are good for dental health, they reduce sweet, pastry and gluten cravings, help with allergies and digestive disorders, chronic fatigue and diseases caused by an acidic environment, and boost overall immunity. Lemon provides vitamin C, A, pectin and fiber to the body, as well as minerals such as like calcium, selenium and potassium. Lemon juice is also a natural anti-inflammatory and helps muscles detoxify by increasing glutathione levels (a powerful antioxidant) within the body. It also helps cleanse the body of impurities that disrupt the functioning of kidneys and intestinal organs, as these are directly or indirectly related to acid reflux. So whether it’s in a juice or squeezed in a herbal tea or glass of water, drink some lemon juice for heartburn every day for optimal health and let’s make heartburn a thing of the past. This juice will not only help you to recover from heartburn but will help to alkalize the entire body. Cut the lemon in half. Core and cut the apple. Cut the cucumber into spears. Juice the apple, lemons and cucumber together. Add the aloe in and mix to combine. Aloe helps soothe the stomach and calm heartburn as well. If you don't have time to juice, try squeezing one lemon in 1 glass of water. Add aloe juice if you have it for an added benefit. If you prefer some sweetness, add a drop or two of liquid stevia.